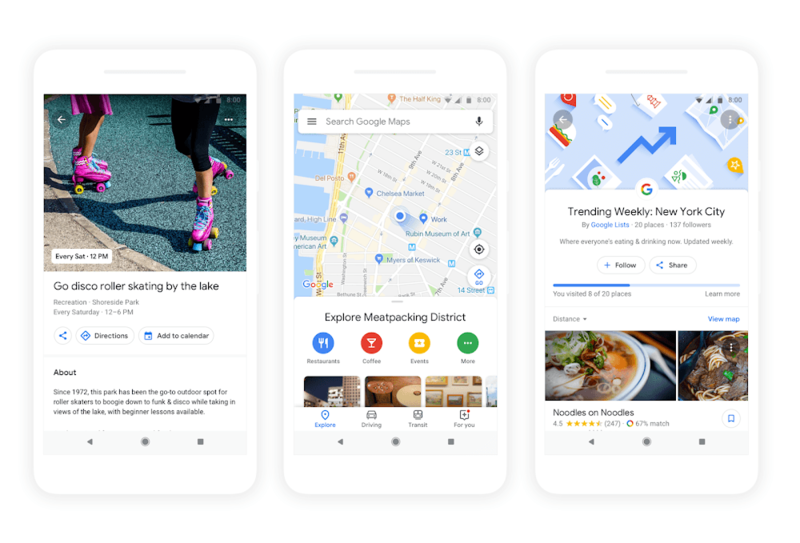 Previewed in May, Google has added a ‘For You’ tab to its Maps iOS app that is rolling out in stages today to users in 40 countries. The Android version of the feature is debuting in 130 countries. Simply follow neighborhoods or places you’re interested in to get updates and recommendations—everything from recent news about an opening or pop up, a new menu item, and even restaurant suggestions based on what you’re likely to enjoy. If you’re making a trip this holiday season, the For You can help you get a jump start on travel planning even before you take off. The For You tab includes its own settings that suggest additional areas to follow based on your location history. You can also add regions manually by panning and zooming the map to show the location in which you are interested. Surprisingly, there is no search bar for finding areas to follow. If the area you pick doesn’t include enough places to track, the app prompts you to zoom out. That’s not an issue in densely populated cities, but in the suburbs where I live, I had to zoom out to roughly a 10x10-mile square that included several towns before I could save the area. Even then, I had to scroll back about a week before I found any local news. Likewise, if the area you pick is too large (for example, the entire New York metropolitan area), you’ll be prompted to zoom in to a smaller area. 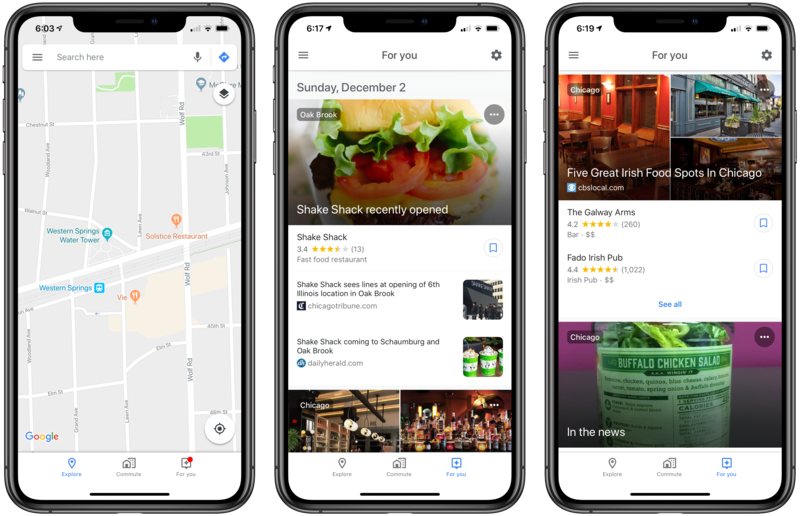 The For You tab overlaps with the Explore tab’s listings of area restaurants but focuses on recent reviews and other news aggregated from third-party sources instead of business listings. If you see a place you want to try, there’s tap the bookmark icon next to it to add it to your ‘Want to go’ list, another list you’ve created, or your ‘Short List’ for sharing with others, just as you can from the Explore tab. In my limited testing, my recommendations were dominated by Chicago. That’s not a surprise, but there were only four nearby entries since the beginning of November, which is a pretty weak showing for suburbs just 25 miles outside of Chicago. It’s worth noting too that the For You tab is limited to restaurants, which I didn’t expect. Not including events feels like a missed opportunity. Despite the overlap with the Explore tab and limited content available, For You should be useful the next time I’m looking for a new restaurant to try in Chicago or visiting an unfamiliar city. The For You tab is being released in stages and will show up in Google Maps without the need to update the app in the App Store. If you don’t see the feature yet, force quitting Google Maps and reopening it can cause the new tab to appear. 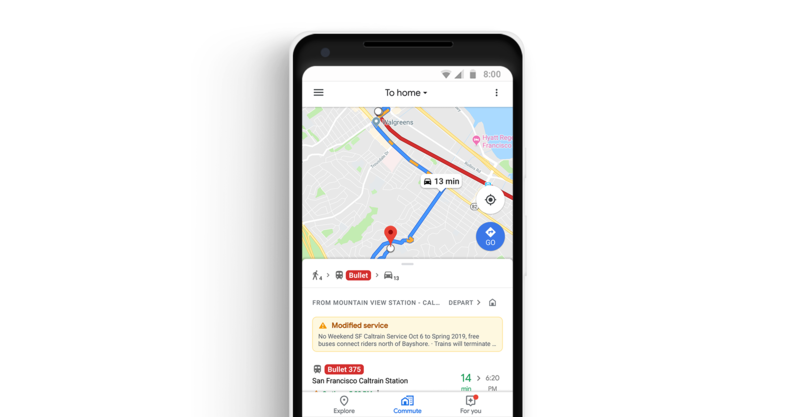 Google announced a series of new features at its Google I/O developer conference that it will add to Google Maps and the Google Lens feature of its Photos and Assistant apps in the coming weeks and months. During the Google I/O keynote, the company demonstrated augmented reality navigation that combines a camera-view of your location with superimposed walking directions. The feature, which works with a device’s camera, can also point out landmarks and overlay other information about the surrounding environment. Google Maps is gaining a dedicated ‘For You’ tab too. The new tab will suggest nearby businesses, restaurants, and other activities based on things you’ve rated, places you’ve visited, and other input. The same sorts of inputs will be used in Maps’ new match score, which will predict how much you will like a particular destination and is designed to help make picking between multiple destinations easier. 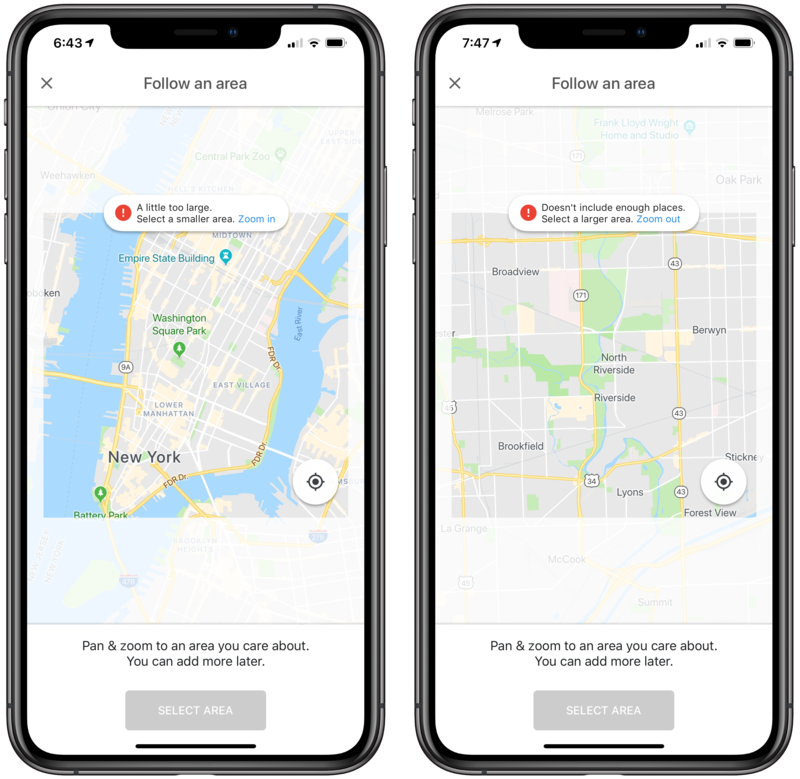 Maps will also allow users to quickly create lists of suggested destinations, share them with friends, and vote on where to go. Google Lens, which is incorporated into the Google Photos and Assistant apps, is also gaining new features. Much like the iOS app Prizmo Go, Lens will be able to recognize text in books and documents viewed through the camera allowing you to highlight, copy, and paste the text into other apps. Lens is adding a Style Match feature which allows users to point a camera at something and see similar items too. In a demonstration, Google pointed Lens at a lamp, which generated a list of similar lamps almost instantly. More than ever, Google is showing what can be accomplished with the vast amount of data it can bring to bear in real-time on mobile devices. The insights that are possible may seem creepy to some people, but if used responsibly, they allow Google to provide powerful contextual information to its users. Google continues to chip away at iPhone X and iOS 11 support for its iOS apps. 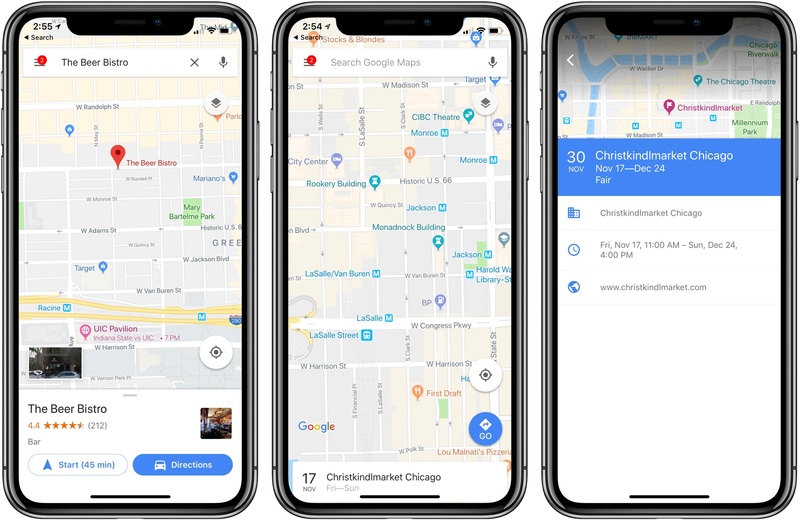 Today, Google Maps was updated to take advantage of the iPhone X’s expansive display. Maps extend in every direction to the edge of the screen, which looks much better than the previously letterboxed version of the app. The design could use a few tweaks though. As Adam Swinden points out on Twitter, the corners of the ‘Explore’ button at the bottom of the screen are clipped and it is too close to the top edge of the Home indicator. Earlier this week Google updated Docs, Slides, and Sheets for the iPhone X and implemented basic drag and drop support. 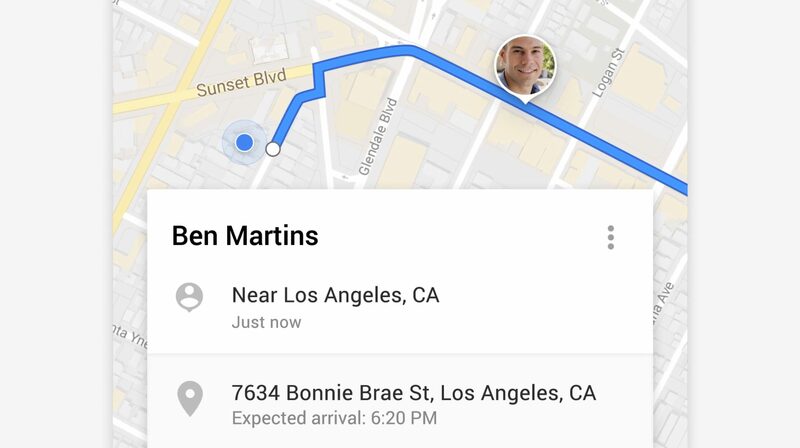 In its latest update, Google has added several new features to Google Maps for iOS. Most prominent among them is Your Timeline, a feature that has been available on the web and on Android since 2015, but is welcome nonetheless. Your Timeline keeps track of all the locations you've visited and allows you to easily view that travel history in one place. 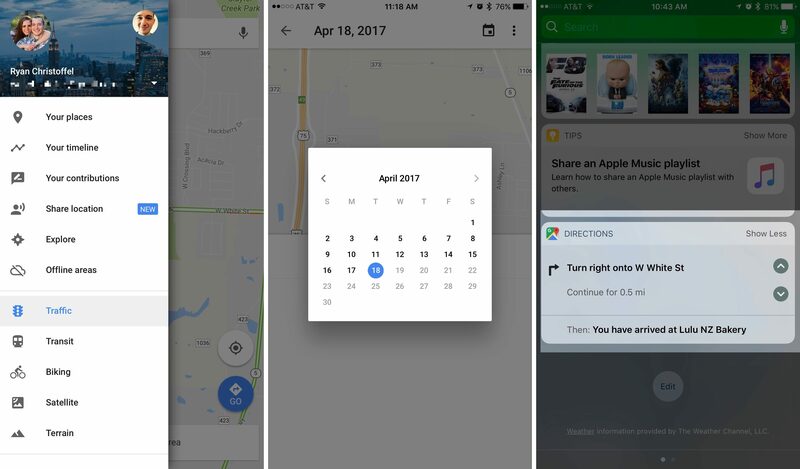 Your Timeline is available in a couple of different locations within the Google Maps app. The primary way to access it is from the main menu, where it's prominently listed near the top. The other place Your Timeline will appear is on the place cards of locations you've visited before. While viewing information about, for instance, a restaurant you visited on a prior vacation to London, you would see a label that tells you how long ago you last visited. Tapping that label will take you straight to Your Timeline and to the date of your visit, so you can easily view other exploits from your trip. There are a couple of nice touches with Your Timeline that deserve mention. One is that you have the option to fully customize the information that's logged in Your Timeline. Besides simply editing a location's name or other basic details, you can also assign an activity to that trip. Options include 'Boating,' 'Hiking,' 'Catching Pokémon,' and many more. A second feature is that you can opt-in to receive monthly emails summarizing all the places you visited that prior month, which is a nice way to revisit and reflect on time past, and perhaps a source of encouragement to visit new places and try new things more often. Although Your Timeline took almost two years to reach iOS, time has at least meant that it's arrived well-polished. The latest update to Google Maps also brought with it a new directions widget and an iMessage app. 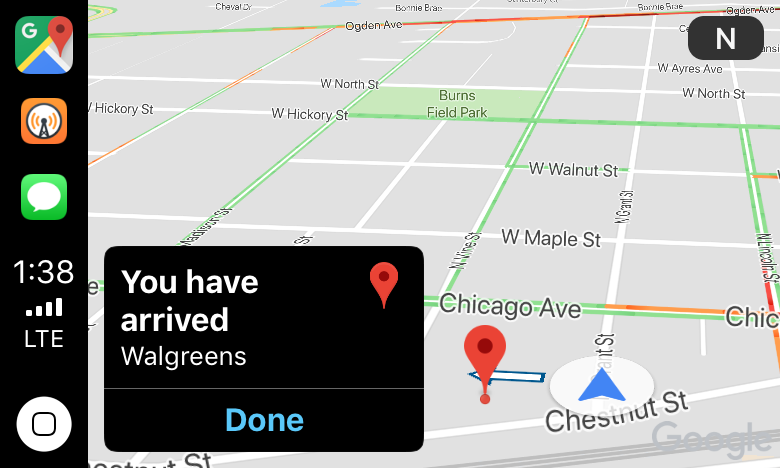 The directions widget provides directions for your current trip, allowing you to scroll through each step of the journey without needing to unlock your device. The new iMessage app serves only a single purpose: sending your static location to friends. Once you open the iMessage app, a still image of your current location is loaded up and available to send by message. It's a simple utility, but perhaps some will find it useful. Announced today and rolling out soon to all users, Google Maps is adding two new sharing features to its iOS app. The first feature allows for Find My Friends-style location sharing. From the app's menu you can select 'Share Location,' which presents options for how long your real-time location will be shared, and who it will be shared with. Next time you’re on your way or running late, you can share your real-time location and trip progress from navigation as well. During your next trip, tap the “More” button on the bottom on the navigation screen, and then tap “Share trip.” When you share your trip with people, they’ll see your expected arrival time and can follow your journey as you head toward your destination. Sharing automatically ends when you arrive. Although the two sharing features perform mostly the same function, this kind of trip-specific sharing seems the cleaner, simpler solution for many scenarios. The example of running late and wanting to provide real-time updates to those you're meeting is a good one. In that situation, you won't want to fiddle with choosing a specific period of time for your location to be shared – you might overestimate and need to manually turn off sharing, or underestimate and have your location stop being shared before you reach your destination. Trip-specific sharing seems like just the right solution, and it's a feature I'm eager to try out.